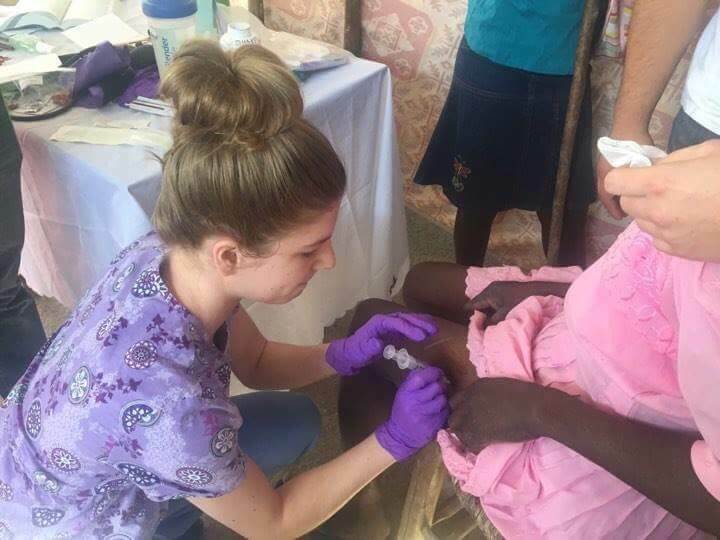 Alex Gentry, a recipient of a Touchmark Foundation nursing scholarship, spent 10 days in Haiti with a team of nursing students and faculty from George Fox University during a school break. Each day, they worked in a different clinic, helping more than 300 infants to elders. She shared that volunteering and using her education to help others was a life-changing experience. We would like to thank you so very much for your food box. We were so blessed to receive the box. You people that work on this are wonderful and caring. Blessings back to you all and happy New Year. Thank you Touchmark for the generous gift box of food. My husband and I have never been on the receiving end before. Thanks to the Elsie Stuhr Center for thinking of us. Bless you and happy New Year. Thank you so much for the food box!! It sure helps; it’s full of delicious, practical food items we can use. The Touchmark Foundation Nursing Scholarship program marked its 10th anniversary in 2016 and granted its 100th scholarship. Thanks to the scholarships, more people have been able to grow into successful careers. For example, Ashleigh Adkins received a grant that helped her finish the last semester of the nursing program at Washington State University. She is now working as an ARNP in family practice at a local clinic. This came at a wonderful time. May was a busy month for me. I completed my Doctorate in Nursing, but I was also pregnant with my first child. She came early in the morning on May 5. Natalie Akhberdova received a scholarship in 2014 and now is a successful registered nurse at a hospital in the oncology unit. She admits the job is a hard one, but it offers so many worthwhile opportunities to help people. I want to tremendously thank Touchmark for believing in me and being a huge part of my success. Nursing is such an amazing field, anywhere from infants to geriatrics, so many opportunities. Sarah Osborn also received a scholarship that year and now works as a CNA at a hospital and in the Home Health department of Touchmark at Meadow Lake Village in Meridian, Idaho. She is now working toward her Bachelor of Science in Nursing. Nursing is not a job for everyone, and it takes a lot of work, but I think all of it is rewarding. Those who pursue it are a special kind of person. In 2011, after 17 years in health care, four kids, becoming a single mother, and working two jobs, Bridget Fechner decided to go back to school to further her nursing degree. It felt like an uphill battle at times, as she support all her children, one of whom was also in college. She worked two jobs, financed all of it, and found time to study. Thanks to several loans and scholarships, including one from Touchmark, she finished with a 4.0 GPA. I have had a lot of ups and downs in my life, just like everyone else. You can’t throw away a dream because of barriers. There is always a way to make it happen. Lynn Fox received her Touchmark Foundation scholarship more than six years ago. Today she serves as the Director of Health Services for an assisted living and memory care community that just received a deficiency-free state survey. The geriatric population is my calling! Over the years, this job has given me many moments of inner gratification knowing I made a difference either in a family member’s decisions for their loved one or with helping a resident through difficult health changes. When I took this job, I was hesitant about working with the dementia population; however, I enjoy this population immensely! I cannot imagine any other job for me! Thank you for your scholarship!